A big hello to all my friends in the music video world! It’s Andy Gesner and the staff from HIP Video Promo with another tremendous video from a band that has received such incredible critical praise this year. This video is the second clip from newcomers KillRadio off their Columbia Records release, Raised On Whipped Cream – “Where Go We” is anthemic and rough; a classic 70’s style Brit like punk rallying-cry of the old-school sandpaper-guitar, shout-yourself-hoarse variety. That they’re capable of putting together a track like this is part of what distinguishes this four-piece from their peers. While other bands are content to venerate the deities of Seventies punk from afar while turning their attention toward crafting a more modern sound, KillRadio makes records that actually sound like they were unearthed from a crate in the back of Malcolm McLaren’s shop. “Where Go We” is about the best of them: candy-fuzz guitar hooks, a huge backbeat, and a sing along chorus with vintage call-and-response vocals. But the star of this show – for this single, anyway – is bass player Dirty. His loose but oh-so-swinging performance is the perfect counterpoint to singer Brandon Jordan’s compelling sneer. Dirty manages to be simultaneously bouncy and threatening, and anchors the song with a relentless quarter-note throb. It’s as insistent as the subject-matter: a non-conformist’s defiant thumbed-nose to the thoughtlessness of authority figures. “We may be your children”, sings Jordan, “but we won’t wear your costume”. KillRadio’s performance have been called revelatory – punk fans whose only context for the music is modern radio have been blown away by a band so close to the original source, and so skilled at mobilizing its revolutionary power. Where so many others have gone awry or been misinterpreted, their antiestablishment critiques have hit home for listeners. 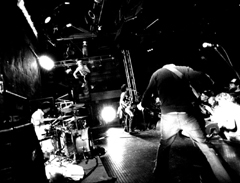 In the video for “Where Go We”, Sean Geer for Refused TV has captured both the magnetic force of KillRadio in concert and the palpability of their connection with their audience. The clip intersperses footage of the band on stage with time-lapse shots of city streets, bridges and tunnels. The camera hurtles down these thoroughfares, racing at superhuman speed toward the performance hall. This is how a KillRadio tour is imagined: a bullet shot through the streets of the country, caroming from venue to venue, barely stopping to unload the equipment and catch a breath. The show itself is, if possible, even more kinetic: we watch Jordan slamming his amplifier with his bare palm, Dirty swinging his axe like a sword, and rapt faces in the crowd staring back at the quartet as if they’ve seen a physical manifestation of the spirit of punk. Lights flash around the band as they play, streaming through the spaces between instruments, bathing the stage in reds and greens. But when Jordan turns to the microphone and addresses the crowd, nothing is more clear than the message. It’s a pleasure to work again on the second video from KillRadio, and we’re thrilled to be part of the team to bring you this compelling video. If you need more info call Andy Gesner at 732-613-1779, or email HIPVideo@aol.com. You can also visit www.KillRadioRevolution.com to find out more about KillRadio.